In partnership with Alberta Transportation, the City of Edmonton is completing a planning study for the future 170 Street SW, from the Anthony Henday Drive interchange to 41 Avenue SW.
170 Street has been identified as an urban freeway to accommodate anticipated regional and local long term traffic demand. Planning will include interchange configurations, arterial roadway realignments, staging, and right-of-way determination. The project is separated into two parts. Part A includes 170 Street from the existing Ellerslie Road to the 41 Avenue interchange, and Part B includes 170 Street north of the existing Ellerslie Road to the Anthony Henday Drive interchange. The 170 Street Planning Study is in the Concept stage of the project lifecycle. Long term planning helps the City prepare for the future road construction and development in the area. 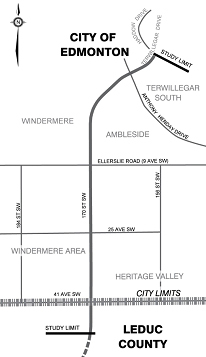 The purpose of this study is to develop plans for a multi-lane freeway with interchanges at Anthony Henday Drive, Windermere Boulevard, Ellerslie Road, 25 Avenue SW and 41 Avenue SW. The 170 Street (Anthony Henday Drive to 41 Avenue SW) Concept Plan was approved by Transportation and Infrastructure Services Committee on April 12, 2011. Note: Transportation and Infrastructure Services Committee was formerly Transportation and Public Works Committee. Provided information and answered questions about the 170 Street Planning Study (Ellerslie Road to 41 Avenue SW).